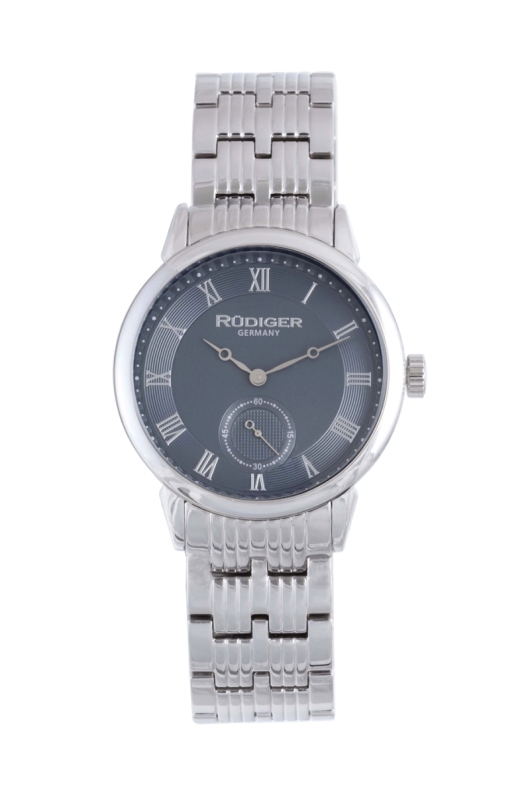 Rüdiger offers watches of sensational value and style. The brand names their collections after beautiful cities, inspired by their German culture and heritage. The Leipzig collection fittingly references Leipzig, which is located in Saxony between two ancient roads, the Via Regia and the Via Imperii. This landscape has drawn many artists into its arms, including composers such as Bach, Wagner and Mendelssohn who called Leipzig home. The city of Leipzig has a timeless quality about it so Rüdiger wanted to honor these characteristics in their watches’ creation. The Rüdiger R3000-04-011 Small Seconds is an example from the Leipzig collection. Like all of the watches in this collection, it has Breguet hands and Roman numerals with an off-center small-seconds in a classical position of 6 o’clock. This model features these elements against a grey dial with silver numerals, giving the watch presence and composure. The layout is perfectly balanced and without clutter so the time is easy to read. Modern men’s watches have trended bigger in diameter and the Rüdiger Men’s Leipzig Stainless Steel Grey Dial watch at 40 mm is a perfect size. Water resistant to 165 feet, it comes on a polished stainless steel five-link bracelet, which is great for summer, as leather bands can get a bit uncomfortable in the heat, and runs off a precise quartz movement. Though the Rüdiger R3000-04-011 Men’s Leipzig Small Seconds watch would fall into the category of a dress watch, it wouldn’t be out of place in a sportier environment. Wear it with a tux to a black-tie musical presentation of Mendelssohn, at the office or just hanging out on the weekend with the family. In either case you have a watch that’s appropriate for the occasion. With the timeless yet contemporary looks of the Rüdiger Men’s Leipzig Small Seconds Stainless Steel Grey Dial watch you will have a good-looking timepiece that will always be in style. In Europe, the Rüdiger brand is distributed by Gevril Group Europa. Join the conversation! Follow Gevril Group on Facebook, Twitter and LinkedIn. You can also follow Rüdiger Watches on Facebook and Twitter.